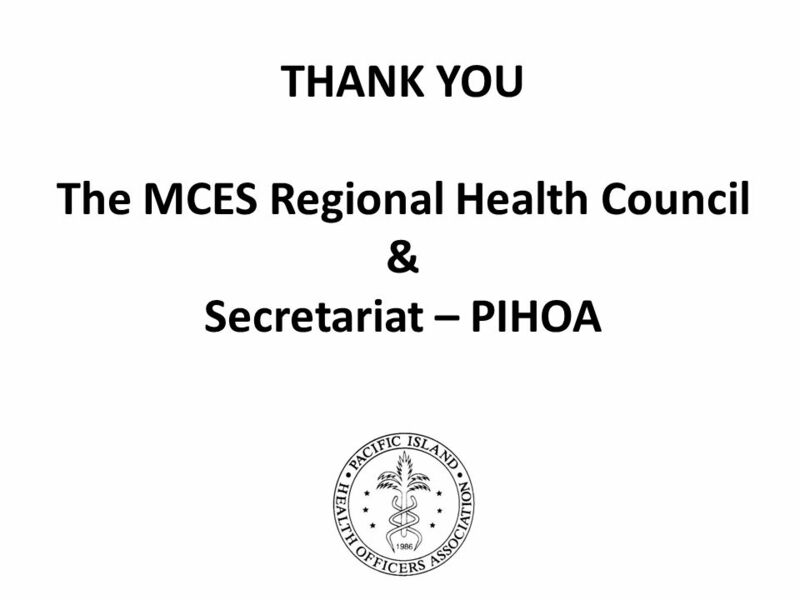 18 th MCES – Regional Health Council Report Pacific Islands Health Officers Association (PIHOA) The Secretariat for the MCES Health Council. 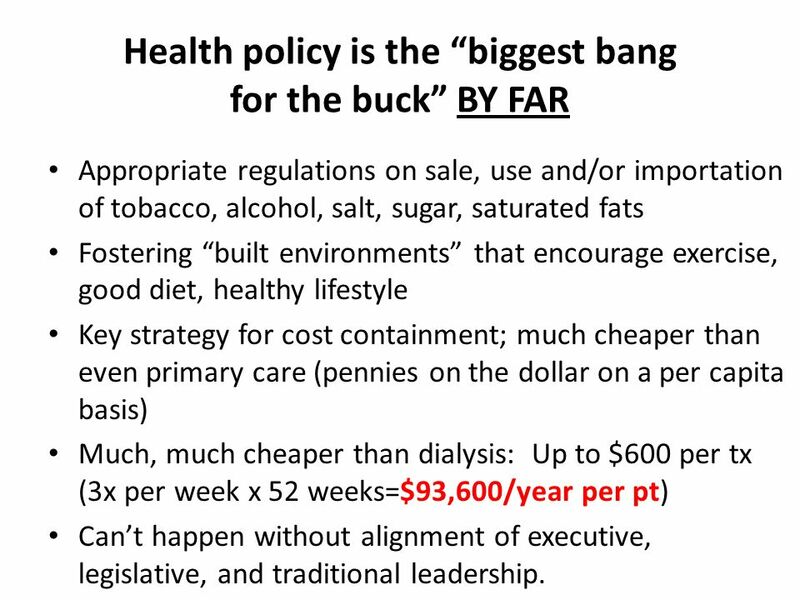 4 Health policy is the biggest bang for the buck BY FAR Appropriate regulations on sale, use and/or importation of tobacco, alcohol, salt, sugar, saturated fats Fostering built environments that encourage exercise, good diet, healthy lifestyle Key strategy for cost containment; much cheaper than even primary care (pennies on the dollar on a per capita basis) Much, much cheaper than dialysis: Up to $600 per tx (3x per week x 52 weeks=$93,600/year per pt) Cant happen without alignment of executive, legislative, and traditional leadership. 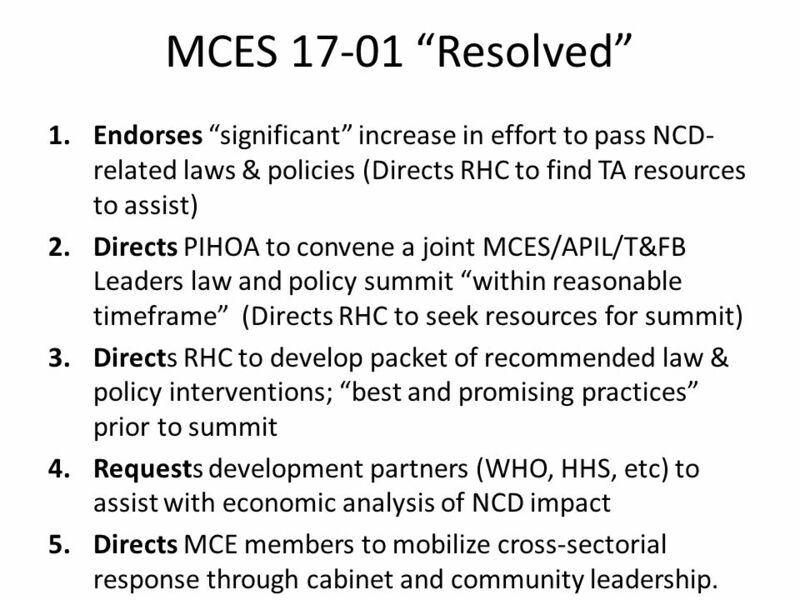 6 MCES 17-01 Resolved 1.Endorses significant increase in effort to pass NCD- related laws & policies (Directs RHC to find TA resources to assist) 2.Directs PIHOA to convene a joint MCES/APIL/T&FB Leaders law and policy summit within reasonable timeframe (Directs RHC to seek resources for summit) 3.Directs RHC to develop packet of recommended law & policy interventions; best and promising practices prior to summit 4.Requests development partners (WHO, HHS, etc) to assist with economic analysis of NCD impact 5.Directs MCE members to mobilize cross-sectorial response through cabinet and community leadership. 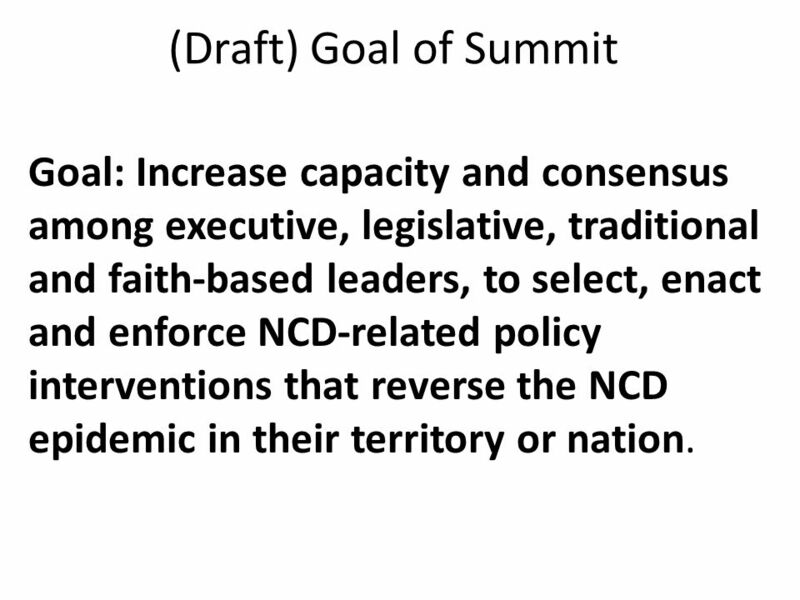 10 (Draft) Goal of Summit Goal: Increase capacity and consensus among executive, legislative, traditional and faith-based leaders, to select, enact and enforce NCD-related policy interventions that reverse the NCD epidemic in their territory or nation. 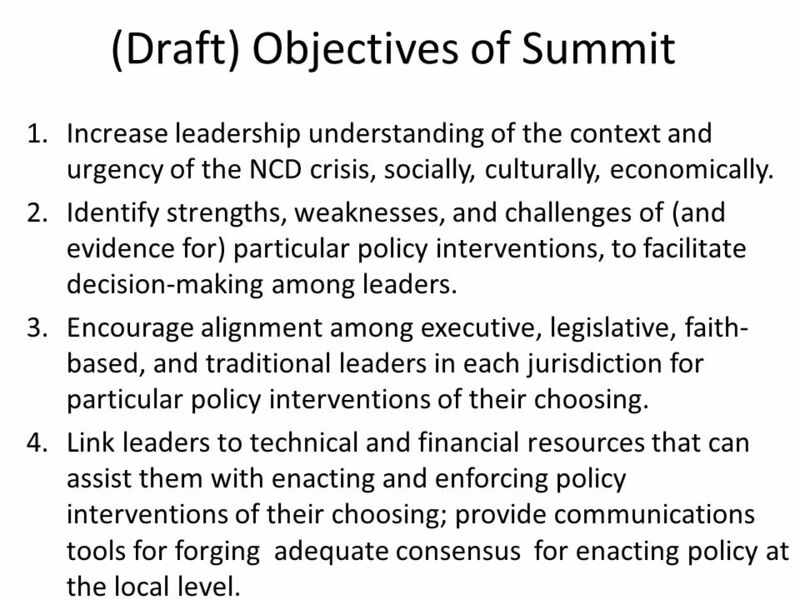 11 (Draft) Objectives of Summit 1.Increase leadership understanding of the context and urgency of the NCD crisis, socially, culturally, economically. 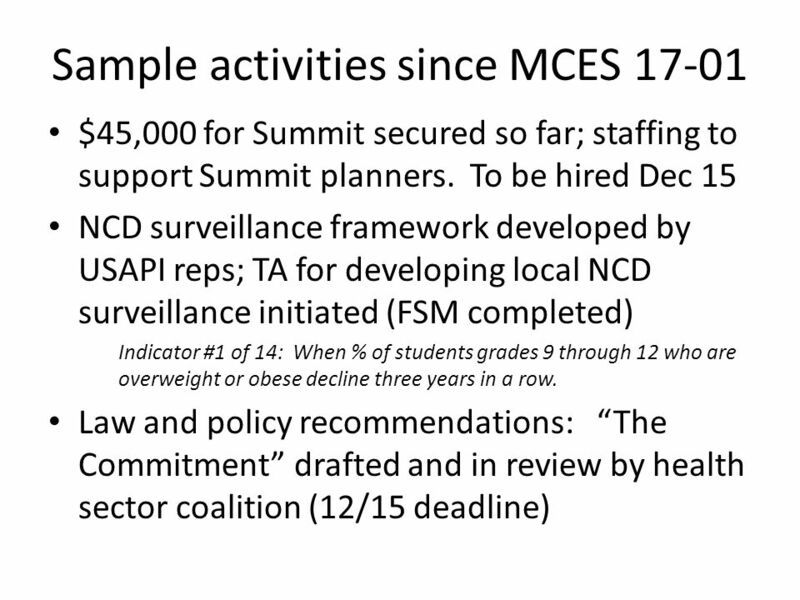 2.Identify strengths, weaknesses, and challenges of (and evidence for) particular policy interventions, to facilitate decision-making among leaders. 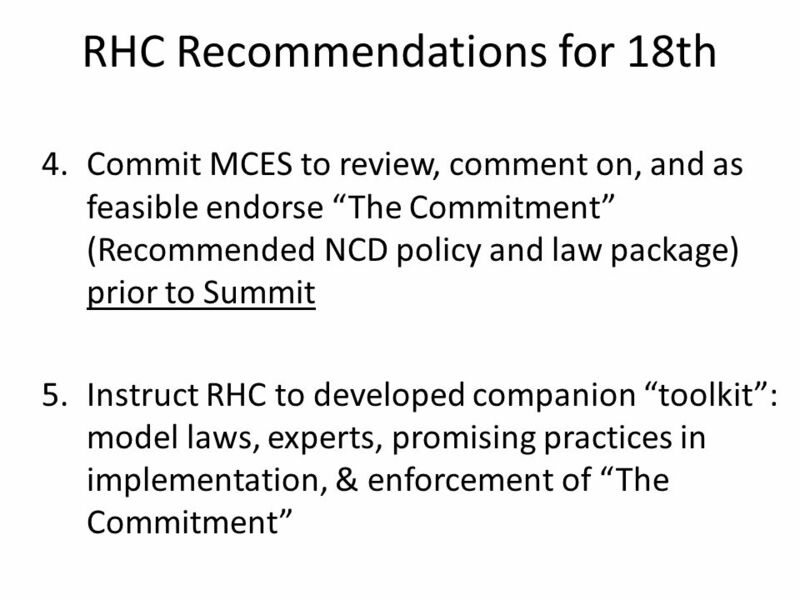 3.Encourage alignment among executive, legislative, faith- based, and traditional leaders in each jurisdiction for particular policy interventions of their choosing. 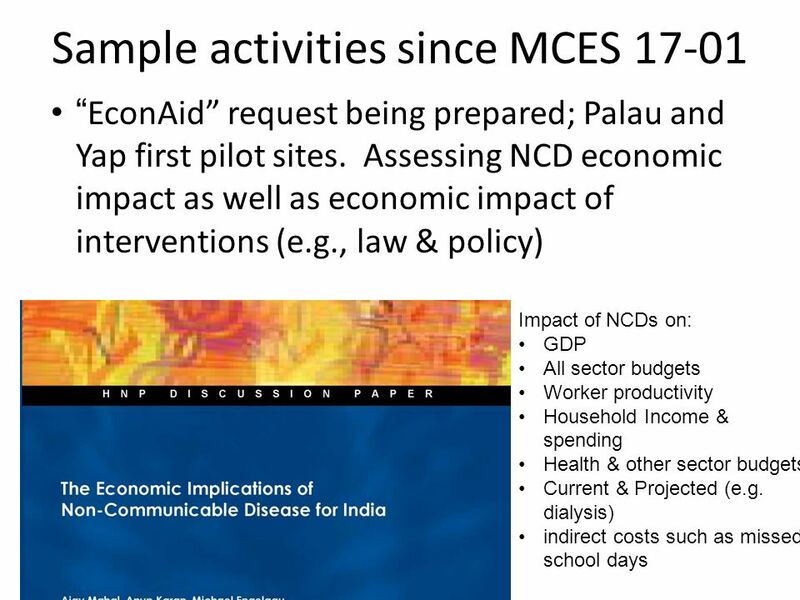 4.Link leaders to technical and financial resources that can assist them with enacting and enforcing policy interventions of their choosing; provide communications tools for forging adequate consensus for enacting policy at the local level. 14 REMINDER: Whos problem is this anyway? 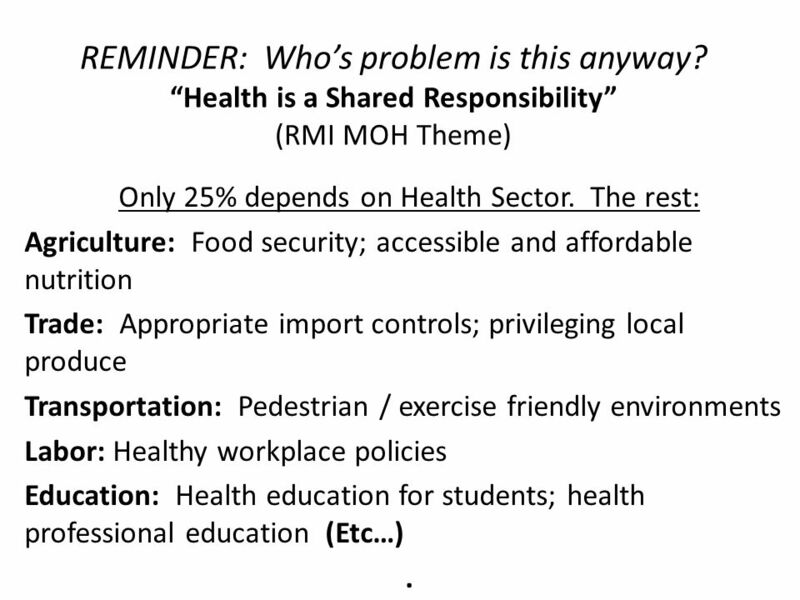 Health is a Shared Responsibility (RMI MOH Theme) Only 25% depends on Health Sector. The rest: Agriculture: Food security; accessible and affordable nutrition Trade: Appropriate import controls; privileging local produce Transportation: Pedestrian / exercise friendly environments Labor: Healthy workplace policies Education: Health education for students; health professional education (Etc…). 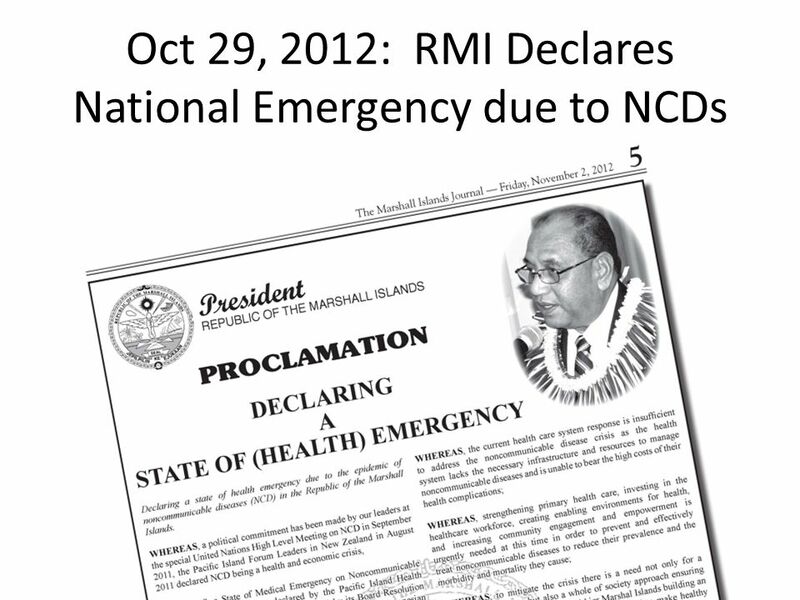 15 The NCD Earthquake has hit. 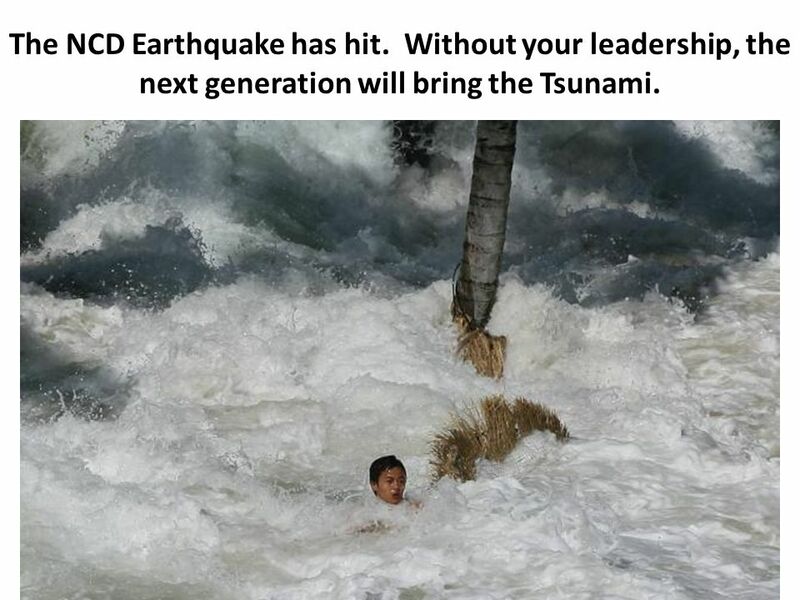 Without your leadership, the next generation will bring the Tsunami. 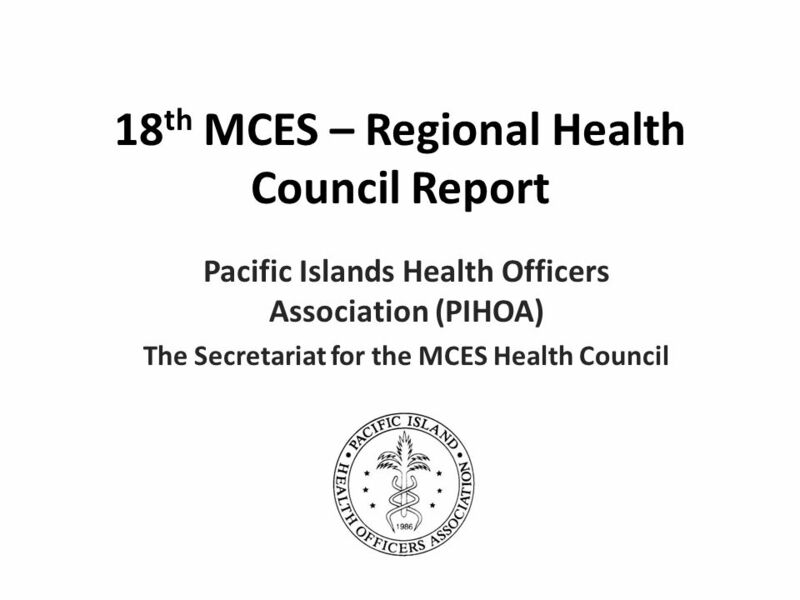 Download ppt "18 th MCES – Regional Health Council Report Pacific Islands Health Officers Association (PIHOA) The Secretariat for the MCES Health Council." 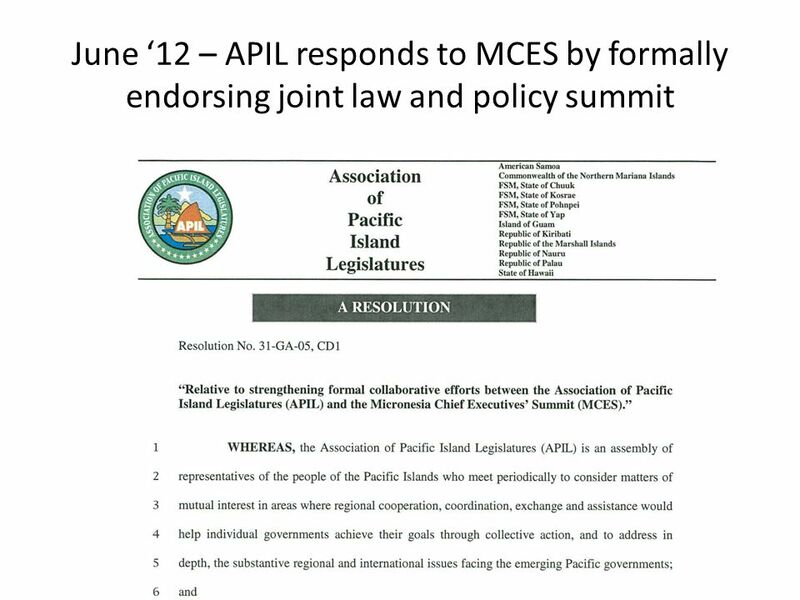 RISC MICRONESIA REGIONAL INVASIVE SPECIES COUNCIL Report to the 18 TH MICRONESIAN CHIEF EXECUTIVES SUMMIT Majuro, RMI November 29-30, 2012. Pacific Regional Digital Strategy II Suella Hansen & Noelle Jones Presentation for APT 28 April 2010. ST'ÁT'IMC EDUCATION & TRAINING Program Highlights 2013. 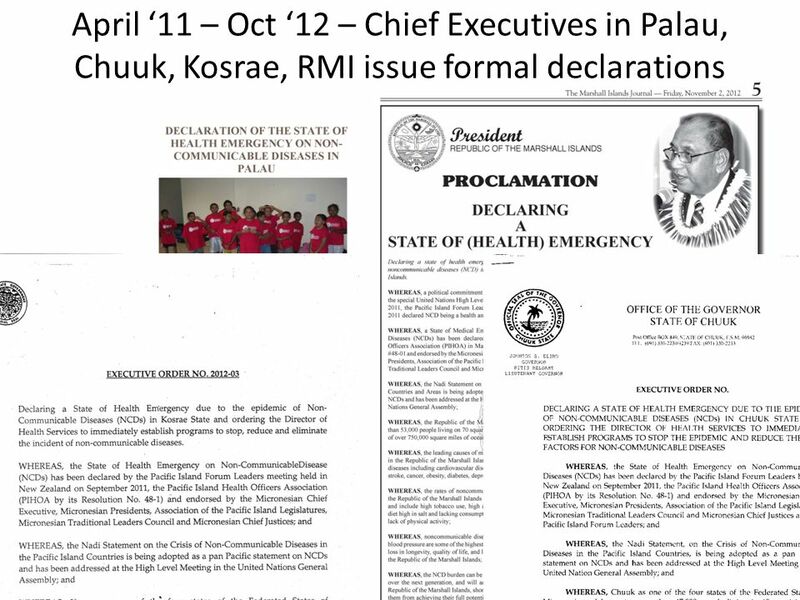 Whole of Society; Whole of Government; The case of NCDs By George Alleyne Kingston, Jamaica 29 May, 2012. Prevention of Childhood Obesity Joining forces… Caroline Bollars Technical Officer, Nutrition Policy Nutrition, Physical Activity and Obesity World Health. 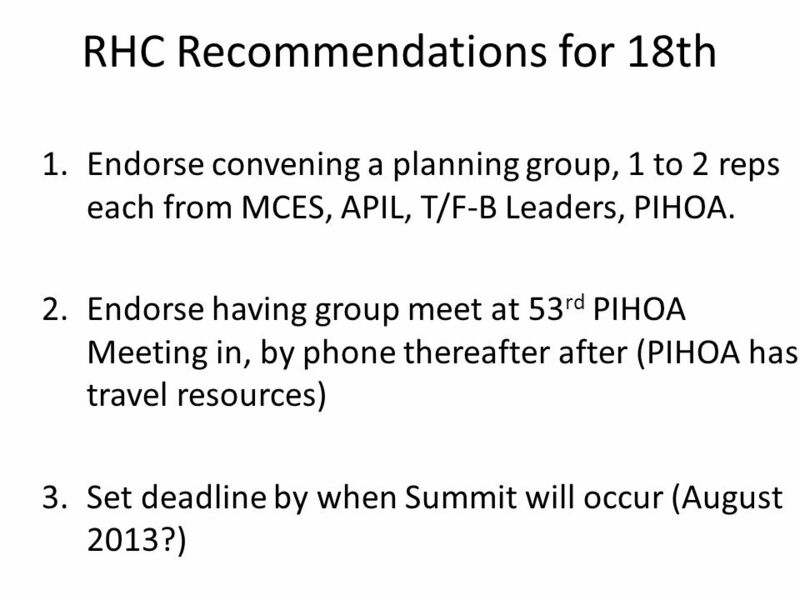 Community-Driven Efforts to Mobilize a Response to Cancer Cancer Council of the Pacific Islands 51 st PIHOA Meeting * November 14, 2011 * Honolulu, HI. 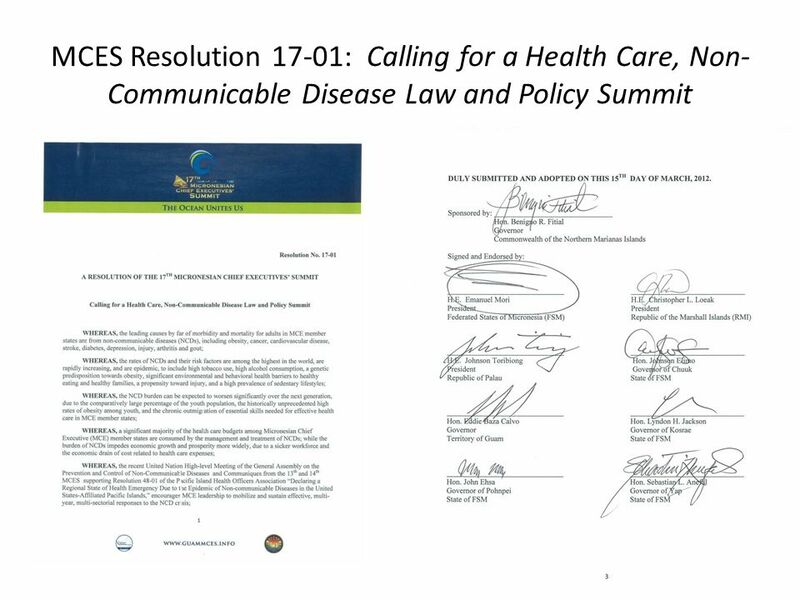 Working together to combat Non-Communicable Diseases (NCD) in [insert jurisdiction here] through Policy Changes, Community Engagement and Collaborations. ASDPE International Health Regulations (IHR 2005) Laboratory and Zoonosis update Dr Richard Brown, WHO Thailand Workshop on Laboratory Diagnosis for Zoonotic.